Eleven days; 5,000 miles; and nine states visited. That was our vacation in a nutshell from June 9th-20th. 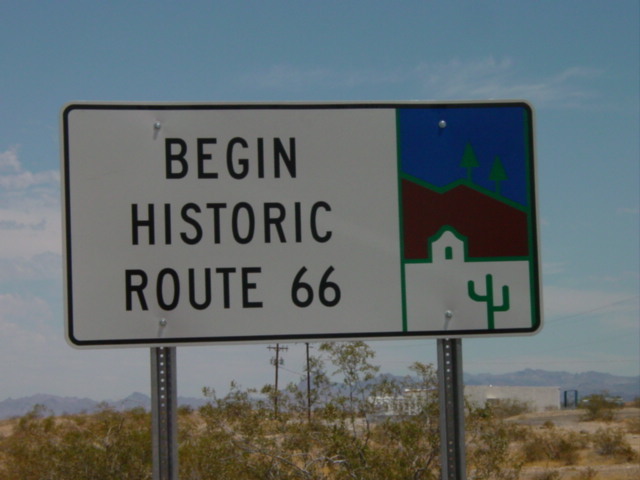 It was a wonderful spiritual journey of tourist sites seen, a last-minute zoo excursion, a side trip to Needles, CA (home of $4.76 gasoline and 111° temps), and, of course, a once-in-a-lifetime drive on Route 66. We began the long road home just past the CA/AZ border, where 66 in Arizona picks up once again in the bleak, sun-scorched desert sands; the Mother Road is a series of hair-raising sharp curves and steep climbs (note that RV’s over forty feet in length, as well as vehicles hauling oversized campers, are prohibited) that take you to Oatman, AZ, billed as a “living ghost town.” Gold was once mined in this part of the country, but the mines have been long shut down and the population has plunged from a prosperous 4,000 to just over 100 year-round residents. Yet, this town with a rich heritage refuses to die; tourist traffic allows the storefronts to remain open and the wild burros (descendants of the long-ago mining camp laborers) wander aimlessly through the “downtown” area, awaiting the next handout of carrots which can be readily purchased from any store owner for a mere $1.00 per bag. Sometimes, as we witnessed firsthand, the burros stop in the middle of Main Street and cause traffic snarls for long minutes at a time. But no horns blare from impatient drivers; they merely wait for them to amble out of the way to their next carrot-ingesting destination. Costumed “gunfighters” also put on daily shows, and a historic inn, The Oatman Hotel (where legendary couple Clark Gable and Carol Lombard spent their honeymoon on March 18, 1939) also lines Main Street. Built in 1902, the structure boasts ten rooms with scenic views of the surrounding area. 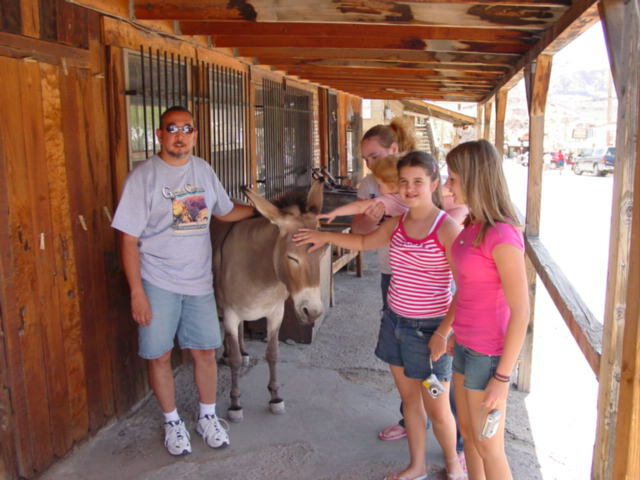 We spent our time in Oatman taking snapshots of the stalwart burros while feeding them a snack, then getting our own late-morning snack of ice cream, and perusing the many gift and t-shirt shops along the road. 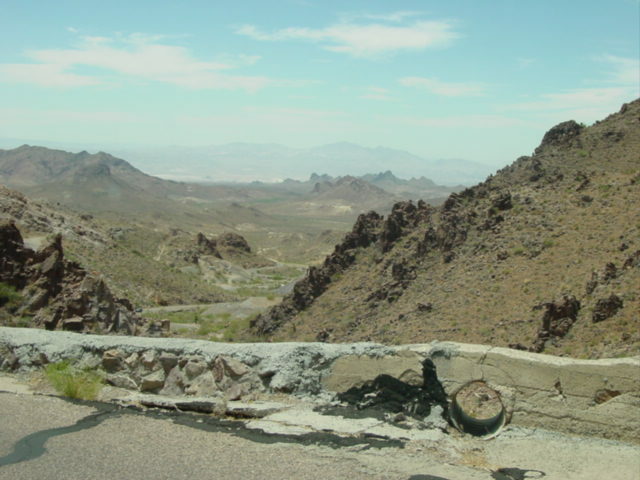 Pushing off from there, we traveled eastbound on Route 66 up through Sitgreaves Pass (with a gorgeous view, if you could stand the very steep drop-off from the shoulder. An interesting thing I noticed is that Route 66 was built with hardly ANY guardrails, so if you drive off, be prepared to deploy a parachute if you have one handy!) through Kingman, then Hackberry (where there is a refurbished old gas station with soda fountain and diner, complete with a 1957 Corvette convertible out front for photo ops), and finally to Seligman. This quaint town offers a true dining experience at the Roadkill Cafe, where their gut-churning slogan reads “You Kill It, We Grill It!” However, the menu names are all a joke; everything is normal food, and GOOD eating. The Snow Cap Drive-In just down the road offers a Tasty-Treat-type of experience, with floats, ice cream, etc. to whet the appetite during your hot summer travels. Seligman also boasts great antique neon signs that still give off an evening glow, giving the experience of a true Mother Road city when the sun sets. 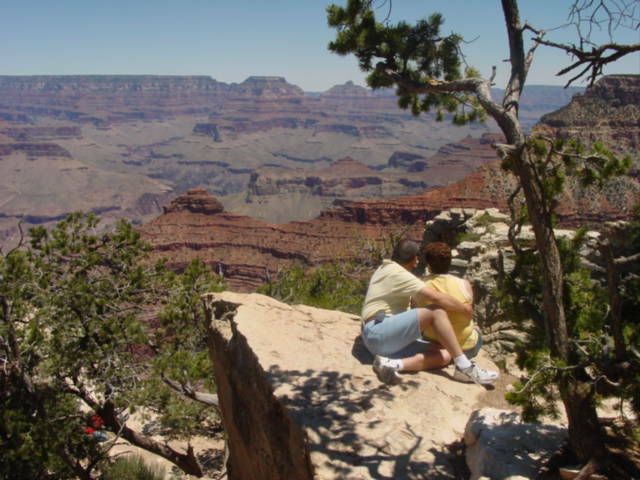 And, of course, we just had to spend a full day at the Grand Canyon. Words cannot really describe what it feels like to stand at the edge of this vast, 70-miles long, 15-miles wide, and 5,000-foot deep chasm. Suffice to say that it is, indeed, a spectacular sight; a true vision of what God has created for both His pleasure, and for our enjoyment. During the day we were there, four condors soared majestically overhead as they searched the land spread out far below us; hundreds of people milled about, almost oblivious to the birds. But as we stood there, it was yet another reminder of just how good the Lord is to us…that He gave us living examples of how we are supposed to rise above this world, and to see things like He does…from a higher perspective. 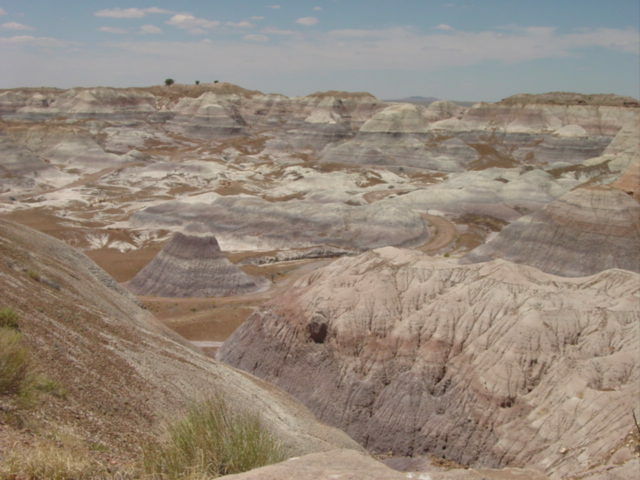 Finally, to top off our journey along hot and dusty Arizona, we made a jaunt through the Petrified Forest and Painted Desert. It was a little out of our way off U.S. Highway 66, but a very welcome one. When you see the huge, now turned to stone remnants of those huge trees, each one tells a vivid story of a once-vibrant and lush primitive forest where only sand and rock abide now; and as we snapped picture after picture of the reds, tans, and browns of the Painted Desert hills, it literally took our breath away. It was almost as if God took a paintbrush and sketched His imagination onto the canvas of our world. How a person could look on that sight and not believe in the miracle of Creation…well, that is truly hard to comprehend. 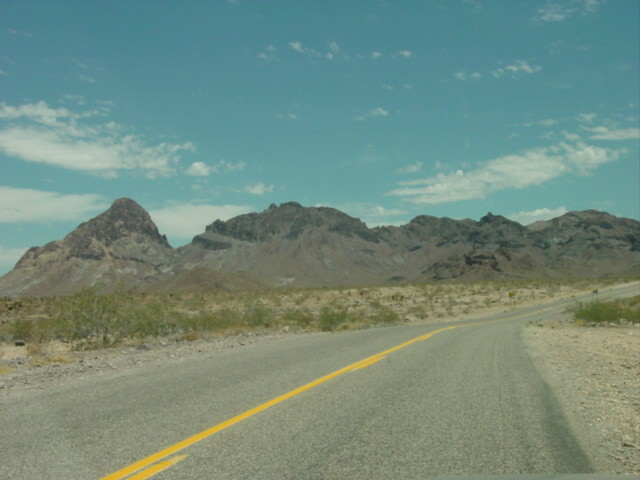 Next month, I’ll reminisce about going through New Mexico and Texas; they were two of the most interesting states in terms of the sites along Route 66. You are currently browsing the Slice of Home, Slice of Life blog archives for July, 2008.